Stellar’s very own lead web developer attended the Waukesha WordCamp last week. It was a jammed packed, full day of learning all things web, security and of course, WordPress. They came back to the Stellar Blue Crew Monday loaded with notes, ideas and suggestions for the entire company. Sitemaps – These are important to have. Both html and xml versions. Marketing Automation Software – Consider it. There are incredible advances in this technology making your website a true lead generators. Consider longer (more quality) blog posts. More 1,500 – 2,000 words per post. 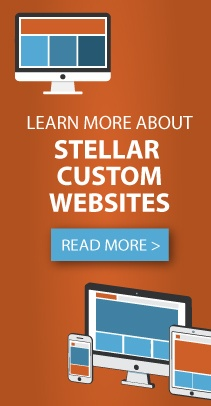 Website analytics (Stellar’s favorite). Rely on data to drive redesign action plan. This is huge! This speaks to Stellar’s point of making sure to use analytic information when doing redesigns. User experience drives engagement. Consider more A/B testing in launching web based campaigns and new websites. Creative wording. Be careful! There are some industry standards that you don’t want to mess with. Ex: Travel agency tried to use “suitcase” instead of “cart” for their eCommerce. During UX testing, people were completely confused. Passwords – Consider updating passwords yearly. And make tiers of passwords for various teams.